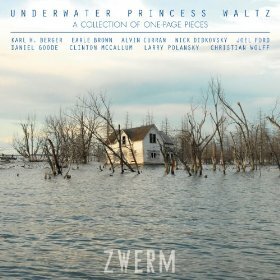 This is an album of pieces whose musical scores are contained on a single page, performed by a Dutch/Belgian guitar group called Zwerm. While that would make it seem like a lot of these pieces would be short, some of them are exercises in minimalism, similar to Terry Riley’s “In C”. Joel Ford’s “Gauss Cannon”, which opens the disc, is a good example of this, containing guitar parts which repeat, intertwine and phase, and accelerate and end up frenetic and chaotic with drums. The two Alvin Curran pieces that follow are both short, lovely, entrancing, ethereal waltzes, played gently on guitars, featuring what almost sounds like a singing saw in the background, but it’s still a guitar. The score to Nick and Leo Didkovsky’s “Mayhem” isn’t a musical one, but a drawing of a cartoonishly violent scene involving skeletons, dragons, a wizard, and lots of weapons, and the instruction to play it is to focus on one detail or line of action and attempt to musically translate it for 60 seconds, so three of the pieces on this album are skronky minute-long noise-rock pieces derived from that (with “The Arrow” surprisingly featuring banjo as lead instrument, and “The Blade” being the most METAL). Christian Wolff’s “Burdocks, Part VII” is scored with a cryptic Anthony Braxton-esque diagram, with prose instructing the players to play notes in certain orders, and the recording involves sinewaves, old radio recordings, percussion, sax, guitar feedback, and other sounds. Larry Polansky’s “tween (k-tood #2)” is another repeating, minimalist piece, which was written for piano, but is played here on guitar instead. Clinton McCallum’s “round round down” was written for Zwerm, and is a mind-melting spiralling staircase of electric guitar notes and feedback. “The Red And White Cows” begins with a spoken math problem involving different colored cows, then goes into a bluesy piece with steel string guitars, bullhorned vocals, stranges sounds and samples, and odd changes and sequences. Earle Brown’s “December 1952” is another piece with a graphic score that’s open to interpretation, so in this recording of it, we get a lovely 8 minutes of towering, spacey guitar feedback. Karl H. Berger’s “Time Goes By” has a slowcore rhythm with organ and vocals repeating the phrase “quite some times goes by” twice, subtracting the first word of that phrase and repeating it twice, and so on, and then repeating the entire sequence over and over, with slight musical variations as well, and eventually improvisations are added into the music (particularly with the percussion and guitar solos), as well as a looping system further pushing things into the vortex, stretching this one-page piece to almost 15 minutes.